The DeWalt Reinforcer Rx has the magnification diopter molded into the polycarbonate lens, so you don't have to wear 2 pairs of glasses. Safety glass and reading glass all-in-one. Handgrip pattern on temple is ergonomically positioned for a secure grip. Soft, rubber non-slip nosepiece provides maximum all day comfort. Rubber tipped temples with belt ribs keeps glasses securely in place. 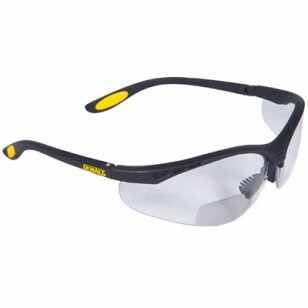 Tough, polycarbonate clear lens is impact resistant and provides 99.9% UV protection. Distortion free lens provides fatigue free use. Protective sleeve included. ANSI Z87.1 certified.